Conventional thinking has been that the human mind is a bottom-up kind of thing. The idea is that your mind is produced solely by some combination of neurons in your brain. The thinking is kind of like this: your consciousness is like some juice, and your brain is the juice maker. But there are some good reasons for thinking that this “bottom-up” assumption is quite false. For one thing, we have no understanding of how mere neurons (physical things) can produce the wonderful thing we call consciousness (a mental thing). Imagining that a mere grapefruit-sized blob like the brain can produce the human mind (a totally different type of thing) seems rather like imagining that a stone can be squeezed so that blood will drip out of it. We also have no understanding of how brains can store human memories that last for 50 years. As discussed here, rapid molecular and structural turnover in synapses should make it quite impossible for brains to be storing memories for longer than about a year. The speed with which we can recall memories seems inexplicable given any theory that memories are stored in brains, for reasons discussed here. Then there is the fact documented by the physician John Lorber that some humans can retain fairly normal minds and memory even though most of their brains have been destroyed by disease. Then there are near-death experiences, in which people undergoing cardiac arrest often report floating out of their bodies, sometimes reporting accurate details of the medical efforts going on while their heart was stopped. Such a thing should be impossible if the human mind is merely a bottom-up effect produced only by our brains. But if the human mind is not a bottom-up kind of thing, maybe it is a top-down kind of thing. Maybe the human mind is an effect produced by some cause outside of the human body. Maybe instead of something coming from inside our bodies, the human mind is instead coming mainly from outside of our bodies. Such an idea seems very abstract and philosophical, but perhaps we can take a stab at trying to make it more understandable, by the use of some imagery. The images I will offer are quite schematic and speculative, but they may at least serve as a kind of crude device to help clarify a particular philosophical possibility. To be visually displayed adequately, a model like the one I will present would require a sophisticated animation; but not being an animator, I'll have to make do with some rather crude diagrams. Let us start by imagining that there might be some cosmic source of minds, which may be the source of human minds and other types of minds (possibly also minds on other planets). We can visualize this mind source as being rather like a giant balloon filled with either hot gas or a warm fluid. Now let us imagine that your mind and the mind of each of us is like a little protrusion or bump on the surface of this giant balloon. We normally think of balloons as being spherical, but a balloon can have lots of little bumps and protrusions (for example, in one of the big balloons used in the Macy's Thanksgiving Day Parade, there may be little bumps corresponding to the nose or ears of some cartoon character). We can imagine that there might be billions or trillions of little bumps on the huge balloon of the cosmic mind source, and that each little bump might correspond to a particular person. In the schematic diagram below, we see two little balloon bumps or protrusions corresponding to particular persons. They exist on the circumference of the great sphere of the cosmic mind source, and are some of billions of similar little bumps or protrusions on that sphere. I use red and blue in this diagram simply to illustrate different persons. But the idea is that the mind substance or consciousness fluid inside your little balloon bump is very much the same mind substance or fluid that is flowing around inside the huge balloon of the cosmic mind source. The same mind substance or fluid is flowing around inside your mind and all other minds that exist as little bumps on the circumference of the balloon. Under this model your mind does not arise from your brain, but from the cosmic mind source. So instead of there being a million different mind sources for a million different humans (each being a brain), there is instead a single mind source for these million human minds. If you got your mind in such a way, by being a little protrusion off of the circumference of the huge balloon of the cosmic mind source, you might think of your mind as originating from inside your body. But in this model your mind does not at all originate from your body. It comes from the cosmic mind source. In fact, under this model the only way in which any mind can exist is by being inside the great balloon of the cosmic mind source, or as a kind of protrusion on the circumference of that balloon. But notice that there is a little neck that connects your little bubble with the vastly greater bubble of the cosmic mind source. That little neck may be almost totally closed, or it may be more widely open. When that little neck is almost totally closed, you may feel no connection whatsoever with some great higher reality beyond yourself. But when that little neck is open wider, you may feel more of a sense of being in touch with some great reality beyond yourself. Perhaps mystical experiences or paranormal psychic experiences occur when this little neck opens much wider than normal. Under this model there is a direct line that can be traced between any one mind and any other mind, with no more than distance and bottlenecks inhibiting communication. So the potential for connectivity is almost limitless. The diagram below illustrates this idea. 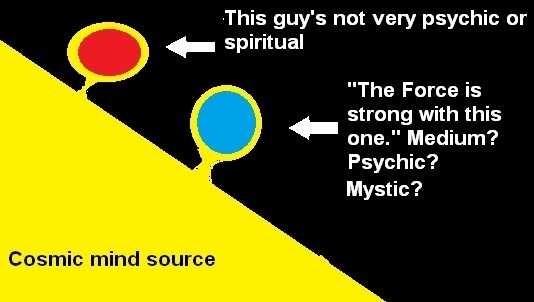 The second person (shown in blue) is much more prone to spiritual or psychic or mystic experiences, because the neck-like opening at the base of his little bubble is much wider. In this model, all minds are inside the same vast balloon of mind-fluid. So when the neck like opening widens, a person may have greater connectivity with other minds, which may or may not correspond to minds inside bodies. In the visual below, I illustrate this idea, borrowing a line from one of the Star Wars movies. In conventional bottom-up models of the mind, ESP is impossible. But in this model something like ESP is quite possible. 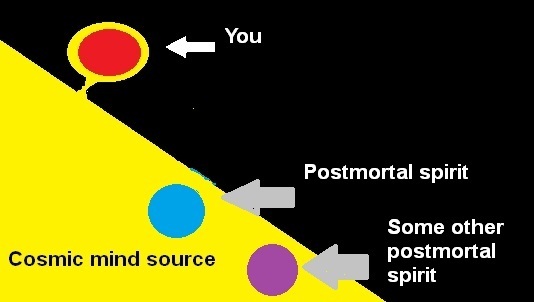 Below is a diagram illustrating what happens. There is a path that can be traced from any given mind to another, since no mind exists outside of the huge bubble of the cosmic mind source. 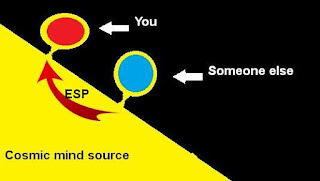 In the diagram below, we see ESP occurring between two minds. 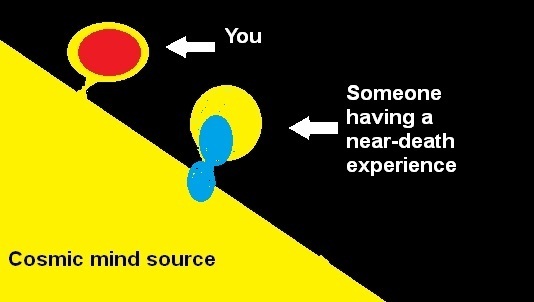 When a person undergoes a near-death experience, it may be a little like depicted in the visual below. Such a person may undergo transcendent experiences, as he starts to move outside of the little bubble like protrusion that he has been previously confined to. And what about when a person dies? 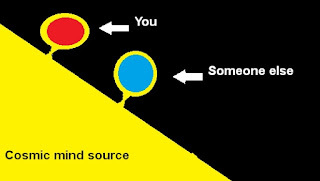 It may be like the diagram below. Inside the great cosmic mind balloon may be trillions of minds, some corresponding to what we may call “the living,” and others corresponding to what we may call “the dead.” The main difference between the living and the dead is simply when you are living, you are isolated in a little protrusion on the circumference of the great cosmic mind balloon. When you exist in such an isolated little protrusion, you have little feeling of connectivity with other minds. But when your mortal life ends, you are no longer in that protrusion. Then you may have a great connectivity with a horde of other minds floating around inside the huge cosmic mind balloon. 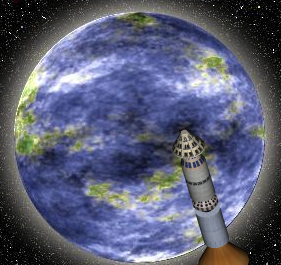 Now you may ask: in this model, what is outside this vast balloon of cosmic mind fluid? The answer is: no mind at all. In this model, there are no little bubbles at all floating outside of the great cosmic balloon of mind fluid. Every single mind exists as a protrusion on the circumference of this balloon, as shown in the diagrams below, or in a more central position inside the balloon. The result is that all minds in the universe have a real degree of connectivity. For minds that exist within the main part of the balloon, and not its outer circumference, there may seem to be a tremendous degree of connectivity. If you are such a mind, you might easily or instantly be able to connect with many other minds, perhaps in something like mind-reading or thought-reading. The images I have presented here are extremely crude. Do things work exactly as I have diagrammed here? Probably not. What I have discussed is a kind of crude schematic visualization designed to make you think about radically different ways in which reality could work, rather than an attempt to describe exactly and literally some alternate way in which reality works. The visualizations I have presented are kind of metaphorical, but there may be strong similarities between these metaphors and the way in which consciousness works. But what is fascinating here is how easy it is to create a top-down idea of mind, under which various types of anomalous phenomena fit in naturally. Under a bottom-up theory of mind, things such as ESP, apparitions sightings, mystical experiences, and near-death experiences may seem like unthinkable abominations. But such things fit in easily and naturally once we move to a top-down theory of mind. The biggest failure of all bottom-up theories of human mentality is not their failure to account for fairly rare paranormal phenomena but their failure to adequately account for the everyday reality of the human mind. We cannot account for our minds or our very long-term memories neurologically. Brains seem to have no functionality that can account for either the storage or the instant retrieval of very old memories, for reasons discussed here and here and here. The idea that there is some special combination of cell connections that can cause something like the lofty thoughts of philosophy to emerge from mere neurons does not seem credible, and seems hardly more credible than the idea that some combination of vines, roots, and trees in a dense Amazon jungle would cause that jungle to become conscious. Nor can we account for the origin of our minds using Darwinian ideas. As argued here, the human mind has many “luxury item” characteristics (such as math abilities, musical abilities, artistic creativity, abstract reasoning, and spirituality) that are not things that increase an organism's chance of surviving in the wild, and which therefore cannot be accounted for by using the explanation of natural selection (which is merely the threadbare, thimble-sized idea that fit stuff prospers, and unfit stuff doesn't). But if we develop a top-down theory of the mind's origin, then all of the marvels of the human mind may become easily explicable. If human minds come top-down from some cosmic mind source, we would indeed expect that our minds should have every wondrous ability they have ever displayed. Let us imagine an extraterrestrial planet on which the skies were always covered with thick clouds. Imagine that on such a planet the clouds are so thick that you can never see the sun in the sky. Intelligent beings on such a planet might wonder: how is it that their planet is lit up with light during the day? Unaware of the sun above them, such beings might come up with a bottom-up theory of illumination: that the dirt and rocks and the trees give off light during the day, which keeps the land illuminated. 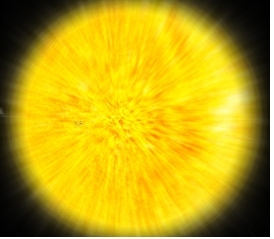 Such beings might think that such a theory was a certainty, and say to themselves, “Of course, it must be true; where else could light be coming from?” But they should instead be considering a top-down theory of illumination – that the illumination of daylight comes from a great unseen source above them. Similarly, the average scientist holds to a bottom-up theory of consciousness, that our consciousness bubbles up from little neurons in our head. He says to himself, “Of course, this theory must be true; where else could our consciousness be coming from?” But such a person should be considering a top-down theory of consciousness, that our minds come mainly from some great unseen source. Just as it seems farfetched that rocks or dirt or trees could illuminate a planet, it seems farfetched that the great universe-pondering effect of human mentality could possibly arise from a little blob of protoplasm inside our skulls. The existence of telepathy also suggests that our minds are part of a communal space rather than being wholly private. This "Universal Structure", as I term it, can be regarded as a higher dimensional information space which reconciles all our different experiences of the world. It necessarily incorporates physical space but it also includes non-physical realms which can only be accessed by mind.